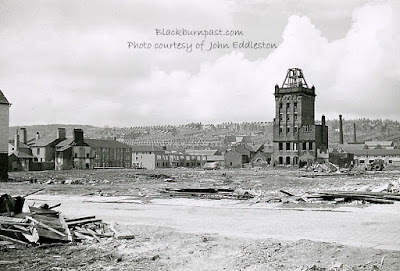 Looking towards the Preston New Rd area in the distance, from the bottom of Montague St, with the tower of Thomas Whewell's Brewery dominating the scene. This photo dates to 1962 /1963, when this area was being redeveloped. Thomas Whewell bought the brewery in 1874 and introduced the tower system of brewing to the site. His limited company was sold to Nuttall's (Lion Brewery) in 1925 and production ceased. 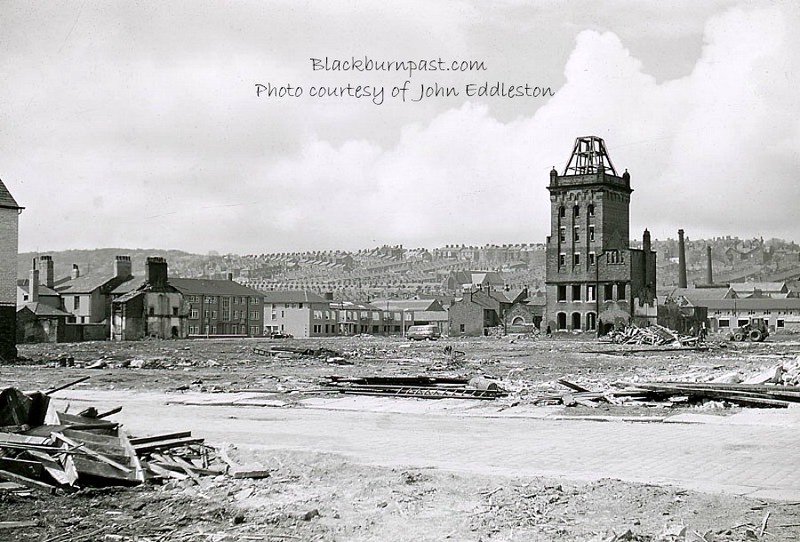 The buildings had various uses from then until they were demolished in the early 1960's. INFORMATION COURTESY OF M. ROTHWELL. Hi I find your site fascinating. I have been searching for my Grandads last known address in 1911 76 Mary Ann Street, but theres next to no information as to where it was, all I can find is that it was demolished in 1958. Would I be right in saying it was where this brewery was? Hi Tina -- Apologies for the late response. I'm having lots of trouble with my internet lately, it's offline as much as it's on. I don't know how well you know Blackburn, if at all. But if you do, then if you were to walk up Montague St from King st and walked up the pavement on the left hand said, there used to be a series of little side streets that ran off on the left hand side. Well the 4th street on the left as you walked up would be Mary Ann St and the 5th street would be Greaves St, which became Oakenhurst Rd. I mention the last, as that is still there. Yes it would be where the brewery is. I couldn't say (without checking an old map) if it was the side closest to the camera or the other side, but one side of the brewery was definitely on Mary Ann St.